Pianist Alexandra Dariescu debuted her re-telling of the Nutcracker story in December 2017 at Milton Court Concert Hall, Guildhall School of Music and Drama [see my review]. The Nutcracker and I by Alexandra Dariescu is an innovative combination of live piano music and dance with digital animation, with a CD forthcoming (including Lindsey Russell reading of Jessica Duchen's story on which the piece is based), and which Alexandra will be taking on a world tour. 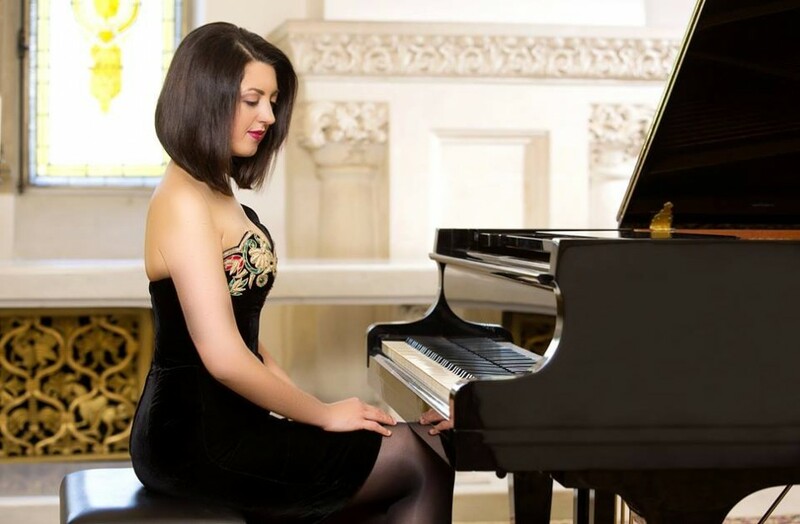 The event is very much Alexandra's project, she not only played the piano but came up with the original concept and was the producer, and she developed the project partly thanks to her participation in the Guildhall School of Music and Drama's Creative Entrepreneurs programme. I met up with her recently to chat about this innovative blend of piano playing and entrepreneurship. Alexandra came up with the Nutcracker idea around three years ago, but she didn't know whether it was possible, just using one dancer with the rest being animated. Holograms were out of the question, so digital animation seemed the best way forward. She did some research on the music available, with different piano transcriptions of Tchaikovsky's music, and then commissioned Gavin Sutherland to fill in the 'gaps'. Attending the Verbier Festival Academy's Reaching Out programme was a great help, this was an intensive three weeks which introduced her to the concepts of a business plan, pitching to sponsors and such like. She then discovered the Creative Entrepreneurs course at the Guildhall and went armed with her Nutcracker idea and the priming from the Verbier Academy. By this time she had already created the trailer; this was important because the concept was difficult to understand so she had invested in the trailer to make the concept clearer. The Guildhall School course really believed in her idea and helped her put her thoughts in order and made her realise that her big task would be fundraising, particularly as she was neither an organisation nor a charity. She calls the Guildhall School very forward thinking and describes Helena Gaunt, the Director of Guildhall Innovation, as an inspiration. Though there are plenty of similar courses in the USA, the one at the Guildhall rather stands out in Europe. Alexandra comments that it shows the college to be thinking about real life, as the hardest time for a young artist is the time after college when there is no structure to their day, no advice from teachers and they realise that achieving their goals is a lot harder than their realise. The school is now planning a short, intensive version of the course. As part of her course, Alexandra attended a weekly seminar with a group of eight artists, a very varied group including an actress, a music therapist and a conductor. There were also one to one sessions with tutors, and she worked on business plans, budgets and SWOT analysis (Strength, Weakness, Opportunities, Threads), all very hard for an artist. Risk analysis introduced the idea of what happens if, encouraging them to think about the worst. The culmination of the course was a very big event where the course participants pitched their projects, giving a presentation and trying to attract money and investors. Alexandra found this very daunting, standing in front of people and asking for money. The Guildhall School was very supportive in other ways and agreed for the premiere to take place at Milton Court Concert Hall, which is an ideal size. When the concert was put up on the website it sold out in 10 hours, so a second concert was added and then a third just for children. Rather remarkably more than 35% of the audience members were under the age of 31; this was part of the idea of her project, wanting to engage with a younger audience. It also challenged the traditional concert format, not just by combining live music with dance and animation, but by lasting only 50 minutes which is a good time for younger children but also means it can be flexible for adult arrangements too. Thanks to its mix of genres and the way it blurs the line between reality and animation, the event appeals to a wide range of people with the combination of dance, animation and technology, and is proving very sellable (ticket prices for the Milton Court events were also quite low). Alexandra comments that taking a family to the ballet is expensive, and young people cannot always afford concerts either. She is continuing to perform the event in intimate concert halls so that the audience always feels part of the story. She found the digital company, Yeast Culture, who would do the animations. They had worked on a similar type of project with Akram Khan, but there the music was pre-recorded whereas Alexandra's project would use live music and a live dancer. It was through Gavin Sutherland that she met the choreographer Jenna Lee. Filming the choreography was difficult, as it was not possible to know how things would look finally on the screen [the animation is based on motion capture of live dancers], and looking back Alexandra thinks that they could have done things in a simpler manner. The animations are all hand drawn on an iPad, with 12 drawings per second that makes a total of 35,000 drawings, the five animators that they started with grew to 32. Two years of work in total. They then had ten days of rehearsals in Milton Court Theatre, and Alexandra admits that that first day of rehearsal was the hardest thing she had done. She sitting at the piano behind a gauze, under bright lights, and playing some extremely hard music, and neither she nor the dancer knew if it was going to be possible. They ended up working around 12 hours per day. And when it came to the performance, she had the challenge of playing that tricky music not once but three times, and after the first performance, she felt tired. The event is very much like chamber music as Alexandra and the dancer interact closely, and with the technician at the back. She calls the premiere the most exciting day of her life, not just for her performance because the initial idea was hers and she was the producer. Being the producer meant that she was responsible for the funding, so that the preceding year, which was one her busiest, she had to combine playing concertos with going back home to write funding applications, as well as making some big debuts and learning new repertoire. She occasionally wondered how on earth it all happened, but she came through thanks to determination and willpower. But she also credits the fantastic team she had behind her, PR Agency, the people at the Guildhall School and at the Barbican and the production team. The Nutcracker will not be a one-off, she has a vision for future projects and is interested in continuing to challenge the concert concept. But Alexandra is taking time to learn and reflect, before the next project. And in the meantime, she has rather a busy schedule as a pianist. In April 2019, as part of the BBC Symphony Orchestra's Total Immersion day on Lili & Nadia Boulanger, Alexandra will be performing in the UK premiere of Nadia Boulanger's Fantasy for Piano and Orchestra with the BBC Symphony Orchestra and James Gaffigan at the Barbican. She will also be giving the UK premiere of Germaine Tailleferre's Ballade with the Royal Liverpool Philharmonic Orchestra and Jessica Cottis. Alexandra comments that it is difficult to understand why these works are not better known but she adds that if you read the reviews of Tailleferre's original performance of the Ballade, the articles are all about her looks! Alexandra feels that she is helping to take a stand, and make it about the music; these are incredible pieces and deserve more attention. She is also giving a recital of all female composer including both Boulanger sisters and Tailleferre, in Liverpool and Gothenburg. The third of Alexandra's trilogy of piano prelude CDs on Champs Hill is coming out (previous discs paired the preludes of Chopin and Dutilleux, and the preludes of Shostakovich and Szymanowski), with preludes by Messiaen and Faure, and she feels that it will be her calling card though admits that creating the CD was quite a journey as sightreading the Messiaen preludes was a challenge. Alexandra like variety and balance in her career, keeping a portfolio of different activities ranging from big concertos (she has recorded Tchaikovsky's Piano Concerto No. 1) to intimate recitals, unusual repertoire (including recording Emily Howard's Mesmerism) and of course The Nutcracker. Looking ahead she is making her USA debut, playing Grieg's Piano Concerto with the Utah Symphony Orchestra and Kazuki Yamada (in April this year) and will be going to Quebec to play Tchaikovsky's Piano Concerto No. 1. She recently accompanied the Romanian soprano Angela Gheorghiu in a recital at the Vienna Staatsoper, which Alexandra describes as a surreal experience. 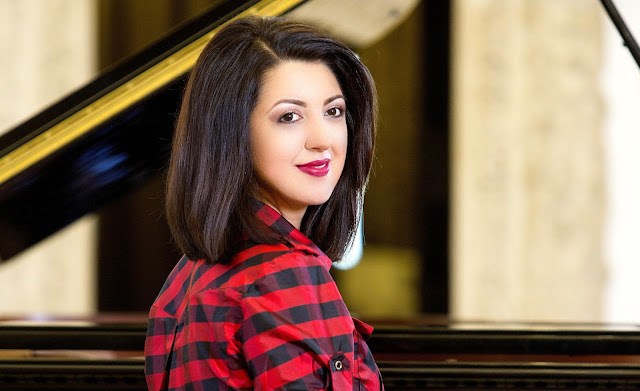 She had a huge number of songs to learn, and just one rehearsal with Gheorghiu, who proved to be an inspiration with the four-hour rehearsal mixing laughter and singing. It was a very full programme, Alexandra played solo pieces as well and for the second half Gheorghiu sang Romanian songs and wore Romanian costume. Alexandra regards the evening as a masterclass both in how to programme but also in the visual aspects of a concert (Gheorghiu had three changes of costume). Away from the concert platform, she was in Warsaw in March this year for a three day European Young Leaders seminar organised by the Friends of Europe, with 40 young leaders under 40, including majors of cities, politicians, journalists and even astrophysicists. There were debates on a wide variety of topics that Alexandra does not normally get involved in (from cyber-security and climate change to the role of Europe in the world). The whole event reinforced her mission to address new ways to present music to audiences.